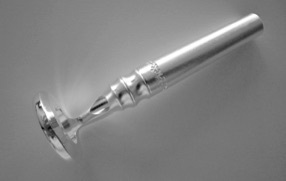 The Asper Pickett Trumpet Mouthpiece Visualizer is an important diagnostic tool used to identify and correct problems with embouchure and the buzz inside the cup of the mouthpiece. The Asper Pickett Trumpet Mouthpiece Visualizers are available in sizes; 1, 1.25, 1.5, 3, 5, 7 and 10. The Asper Pickett Trumpet Mouthpiece Visualizer should be used as part of a daily comprehensive mouthpiece routine including your trumpet mouthpiece. This daily routine is discussed in Mr. Asper's book A Mouthpiece Buzzing Routine for Trumpet and in the Visualizer Users Guide from the Home Page. How is the Asper Pickett Trumpet Mouthpiece Visualizer manufactured? The Asper Pickett Trumpet Mouthpiece Visualizer is manufactured entirely by Pickett Brass. It has a 5.7mm pilot hole which allows the air to pass through it. 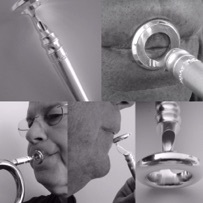 The visualizer can be held by the fingers, or placed in the trumpet. All visualizer sizes listed here use the Pickett Brass trumpet mouthpiece size specifications.